‘Unraveled’ in the English language can mean the emotional state of being completely frustrated and perplexed or it can mean being untangled – either physically or psychologically. The transformation from being in a place of confusion and fear to being in a place of release and freedom happens as we allow Jesus to touch us and to untie us from our bondages – in whatever form they exist in our lives. It is a wonderful mystery that he does not just make us strong but uses our weakness to be strong in us, ‘from glory to glory” changing us into his image (2 Corinthians 3:18). We are in this sense constantly in the state of being unraveled in both senses of the word. Some artists have the ability to translate life experiences into visual expressions that without words many others can identify with and feel emotionally connected to. Doris Auxier is an artist who can do just that. This is demonstrated so well in her series “Tangles and Glory” (2004-2008). 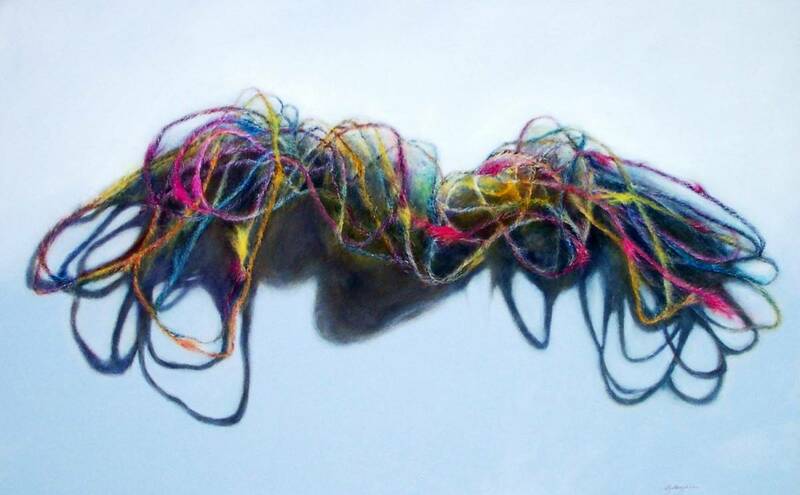 By bringing attention to what are common materials and experiences through her careful observation and then her long process of layered painting, working the canvas as though she herself was recreating the very threads she is looking at, she creates not just a copy of the material she observes, but the memory of what it has been through. She shows us the pain of being tangled and torn as in these images we see ourselves. We see ourselves because we know what being tangled and torn feels like and we believe by how she has expressed it that she does as well. The first piece in her ‘Tangles and Glory’ series was done at a time of inner spiritual struggle when she happened to notice a matted, tangled mass of jute on the ground. It had been run over by vehicles and worn and torn by exposure to the elements. Doris said she immediately felt an affinity to this shredded mess as though it was herself she saw lying on the ground before her. For most of us this would have been the end of our encounter with a personal metaphor that spoke to us. We may have thought, ‘yes, that is just how I feel,’ and then carried on with our day. But Auxier picked up the tangled mess, as God picks us up, and took it to her studio. She set about working on it as a daily meditation and in the end made it into something stunningly beautiful, not by changing it back into a perfect piece of untouched material but by infusing it with a beauty only found in something that has been loved and transformed. God infuses us with his glory, she says. He does not come when we are beautiful. He is the beauty in us. This is our redemption. In Unraveled, which the artist is still planning to rework, we can see more of the brutality of suffering contained in the fabric and the life it represents. It is intense and dark and bloody like a crucifixion and yet again surrounded and covered with a light and a tenderness that do not deny the pain but offer hope. Each of the paintings Auxier has done in this series manages to show this balance, this tension, in life. Doris does dozens of studies in paint or graphite that isolate and ‘pose’ the materials of yarn or rope, attempting to show by the physical ‘attitude’ of the material the idea of having come through suffering to a place of being still. This place of stillness and waiting, she says, is what she wants in her own life – to be in a place of waiting trustingly for God’s help and mercy. The empty background that isolates the figure is an intentional silence. It is the stillness in which one can begin to hear and see and heal. These paintings are visual metaphors of Auxier’s investigations of God’s interaction with human weakness, which in turn become meditations for the viewer. The effect of her work is visceral and believable and makes it possible for us to imagine that God does work with us with patience and tenderness, untangling our confusion and our knots, coloring us with his glory and infusing our lives with peace. 1. Gabriel’s Wings, 2004, acrylic on canvas, 18.5 x 40 in. 2. First Offering, 2004, acrylic and graphite on canvas, 36 x 36 in. 3. Unraveled, 2008, acrylic on canvas, 38 x 48 in. 4. Soft Kill, 2004, acrylic on canvas, 38 x 60 in. 5. Magnificent Obsession, 2007, acrylic on canvas, 48 x 48 in. 6. Gabriel’s Wings, 2014, acrylic on canvas, 18.5 x 40 in. 7. Waiting, 2007, acrylic on canvas, 48 x 48 in. Currently Doris Auxier has a show on exhibit at the SAMC Gallery in the Norma Marion Alloway Library on the campus of Trinity Western University in Langley, BC Canada. It's entitled Amid the Shadow and the Soul: A Visual Meditation and will be on display until March 25, 2018.